Wear the top as a dress and show off some leg. This is my getting ready camera. Taking pictures and not trusting mirrors. I love vintage clothing, never know who owned something before you. I haven't touched up my hair since January, time to sit in a chair for four hours and get this puppy done. If I wasn't so demanding with bleach it wouldn't take so damn long. Had such a hectic week so it's nice to sit down and chill out. I went to see Date Night with some girls from college yesterday; Purusha, Naledi, Saadiqah, Mubeena and Demet. Have you ever heard a better batch of names? Lovely. 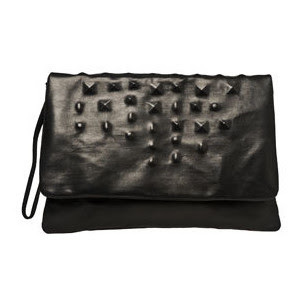 Afterwards Demet and I went to Country Road where I got a leather covered pyramid stud wristlet/clutch in a similar vein to this Jas MB clutch. I'm in love.